However, whenever an election is called, and whatever result it returns, Fine Gael is not going into partnership government with Sinn Féin, according to Tánaiste Simon Coveney. Kicking off the party’s Ard Fheis in Citywest in Dublin last night, Gerry O’Connell, Chairman of National Executive told the crowd that the dominant message that will emerge from this year’s Ard Fheis is that Fine Gael is ready to go to the polls. “Whenever it is, wherever it will be, wherever it will be called, we will be ready willing and able to defend our position as the largest party in Dáil Eireann when he next general election is held. “The time for preparation is now over – the message to take back to your constituencies is to prepare for a general election whenever it happens, to prepare with your candidates and with your organisation,” said O’Connell. 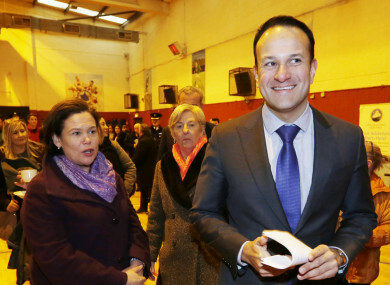 Whether Fine Gael does win the most seats, the prospect of coalition with Sinn Féin was ruled out by Simon Coveney. There was much speculation over the summer about a possible Fine Gael-Sinn Féin coalition, when Mary Lou McDonald said she was open to talk to all parties about a future partnership government. Fine Gael ministers, including the Taoiseach, have ruled out any coalition with Sinn Féin after the next election. Yesterday evening, Coveney said a proposed rule change within his party which will give the party membership more of a say into what party Fine Gael enters into coalition government with, should reassure people that a Fine Gael-Sinn Féin government is not on the cards. “Fine Gael have ruled out Sinn Féin as a coalition partner – we just don’t think we are compatible from a policy perspective, so it is not going to happen,” he told TheJournal.ie. The constitutional rule change for the party will ensure that a special party conference will have to be convened if the party decides to enter into a coalition government with another party or enters into another confidence and supply arrangement. Party members, such as councillors, will have an input into the decision through a weighted vote. “I think one of the ways people might believe us when we say that is making this rule change which I think will be supported by a huge majority this week where essentially we are shifting the power in the party, somewhat, in a post election scenario, when a negotiating team on behalf of Fine Gael may negotiate a coalition government and then will need to get the endorsement of that deal from the party membership and I think that is right. “I think if we cant sell to our own membership a proposal in terms of how Fine Gael wants to lead the country then I am not sure we should be doing it at all,” said Coveney. I don’t think there is any chance that Fine Gael under Leo Varadkar or anybody else quite frankly is going to propose a coalition government with Sinn Féin and I certainly don’t think if anyone was to suggest that that it would be supported by the party membership. Email “'It is not going to happen': FG rule change to copper-fasten promise not to enter coalition with SF”. Feedback on “'It is not going to happen': FG rule change to copper-fasten promise not to enter coalition with SF”.